Thanks, Gary, for the newest update on how Western culture is doing since it rejected the gospel of Jesus. I wonder. What if somebody “falls in love” with their dog? Or their favorite toothpaste? 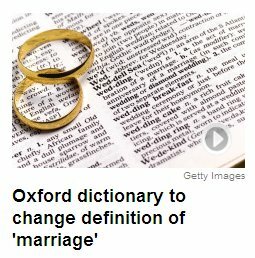 Wonder what the Oxford dictionary will do then? I wanted to tell you about an experience I had yesterday. After work I had gone to Walmart to get some groceries. On the way home on the highway I noticed to the left of me in the fast lane 2 motorcycles with young kids on them, then I looked in my rear view mirror and saw a young boy on a street bike. He was so close to the back of my car I thought he was going to slam into me but he swerved and went into the other lane and then swerved back in front of me just as close. It scared me so that I jumped, but all I could do was cry out to Jesus. The spirit just fell in my car and I started to cry and said very loudly, “O Jesus! Help that foolish young boy, please keep your hands upon him!”, and I started speaking in tongues. It was the most grievous feeling it sank to the pit of my stomach. It stayed with me until I was almost home. I don’t know if I have ever felt that way before. I’ve really had on my mind lately about how I received the holy ghost, so I decided to write it out in “short form”. Thought you might enjoy reading this. In the summer of 1996, I began feeling that I wanted to know whoever it was that really knew God, and I wanted to learn from him. I was a young man in sin at that time, but God had put a strong conviction on my heart to be free from it, and to live a godly life. The following summer, He introduced me to a group of people and their pastor, John Clark, who met regularly in their homes to study the Bible and pray. This group taught that you could live without sin, but not without the Spirit of God in your life, and both were necessary to be saved in the end. Part of the conviction that God put on my heart was to make the “wrongs” in my life as right as I could, and to treat people in a way that I thought would please God. If I had stolen something, I had to return it, and pay interest, too. If I had lied or misled someone, I had to make that right. There was a lot I had to repent of, but it was not at all a burden; it was a relief. After a few months, I was in one of these home prayer meetings. While everyone in the group was praying, my jaw started shaking, almost uncontrollably. I had never heard of nor experienced such a thing before. I said to my wife, who was kneeling beside me, “My jaw will not stop shaking, I think something is going on.” What that something was, I didn’t know, I just knew that this was new to me. Within moments, I began weeping in a way that I had never wept before, from the very bottom of my belly. When I finished crying several minutes later, I then felt a tickle from the same spot, deep in my belly, and I began to chuckle. This chuckle slowly turned into the most intense laughter I had/have ever experienced in my life. While laughing like this, I felt like God let me inside His mind, and this is what I “heard” – “Try to think of a problem. There are no problems with Me. There is not a single thing you can think of that is a problem for Me.” Just the thought that something was too big for God was absolutely hilarious to me. While I was on that floor, I didn’t just believe that there were no problems for God, I KNEW it. When I awoke the following morning, I had a joy like never before. I was so very, very happy. Words cannot describe the joy I was feeling – it was like heaven on earth. One of Jesus’ disciples, Peter, talked about “joy unspeakable and full of glory”, and that’s exactly how I felt. Amazing things continued happening in these prayer meetings after this. In one meeting, many saints were standing around praising God, and the Spirit was moving. I remember being hunched over near a dear brother named Earl Pittman, and when I felt the Spirit of God “swoosh” by us, the thought hit me, “Oh man, he’s going to lay his hands on me.” That’s exactly what he did, and as soon as he did, a sentence or two in a foreign language flew out of my mouth. I had no control over this whatsoever; it just came out, as if I was a life-long, fluent speaker of this language. I came to find out later what had happened to me – I had received the “baptism of the holy Spirit and fire”. This “fire” is what it takes to not only know God, but to also live a godly life. After this happened to me, the sins that had held me captive for years completely vanished away; things that had been such a struggle were suddenly no struggle at all anymore. I had been a fairly heavy drinker in college, and though I very much wanted to quit, I never could. At the end of a long theatre production I was in, the cast and crew were throwing a party. I grabbed a glass of champagne, as I normally did, and a new feeling hit me – I don’t want this anymore. For the first time, there was no attraction whatsoever to it, and there hasn’t been to this day. This was just one of many things that began changing in me, and what I have learned is that this is a process that doesn’t stop. As long as the Spirit and power of God are welcome in our lives, we will continue to be changed, and to know God more and more. One thing I love about God is that there are no dead ends in Him. If we think we have a problem, are in need, or lack the knowledge of God, God doesn’t strain a bit to deliver or provide for us. That’s what He did, and is doing, for me! It sure did feel good getting prayed for last night. I had the best night sleep last night! That means a lot. I did not wake up every 2 hours hurting. It was precious when baby JD came over and kissed me on my knee and said, “It will feel better now.” It made me cry. I sure do love my family Jesus gave me! Whew John, I have been listening the The Father and Son cd today and each time I get to number 6 ….The Love My Father Had For You….I melt when you sing, “The only thing that kept Jesus on the cross…. was love…the love he had in his heart from the Father for us…” I can’t type this without tears filling up in my eyes. Whew!!!!! I think we are really seeing how much he loves his Father, but oh so much how he loves us!!! So sweet! Greek writers in Jesus’ time. If I’m correct, the Romans were the authoritative power ruling Jerusalem and most of the world during Jusus’ time. Why wasn’t the original text from the Gospels and the NT written in Latin . . .was it because the disciples and others were educated in the Greek language before Roman occupation and rule? Because of the conquests of Alexander the Great, a few centuries before Jesus’ time, the Greek language became the language of commerce throughout the Mediterranean world. Virtually all educated people knew Greek, and many others spoke it. So, it was the closest thing to a “common language” for all the regions of the Empire. Richard and I had been trying to have a baby. As the months went by, I began feeling very discouraged. One morning when I woke up feeling discouraged, I started talking to Jesus about how I was feeling. I asked him if he could just send me something encouraging that day. When I arrived at work that morning I checked my emails one last time before starting my day. I opened the Photo of the Day. The caption read, “A Joyful Mother of Children”. It was a beautiful picture of Carrie and down in the right hand corner was me, happy and smiling. I felt the sweetest feeling come over me when I saw the picture and I knew that Jesus was answering my prayer. Later that afternoon, Gary sent out another Photo of the Day for that same day. In his email he said the previous photo sent out that morning (the one with Carrie and me) was a mistake and he did not know how that had happened. Ha! Jesus is good. When I saw the Photo of the Day for July 8th, that same sweet feeling came over me and it brought tears of thankfulness to my eyes.